In this twenty-third video volume of 24 volumes 3D Instructor Adam Gibson demonstrates how to use 3D Coat's powerful PBR Materials and Alpha Brushes to bring realistic detail to a Sci-Fi Dropship. Topics: Input Normal Map Creation, Creating Automated Input Maps, Selecting Smart Materials, Editing Smart Materials, Creating Modified Smart Materials, Baking & Exporting PBR Materials, Export Presets, Importing Textures into Lightwave. 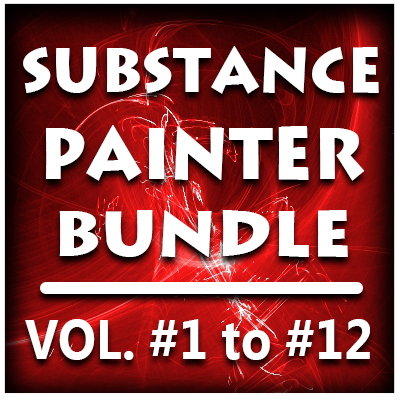 *Bonus: Includes 100 Free Sci-Fi Alpha Brushes. New!! 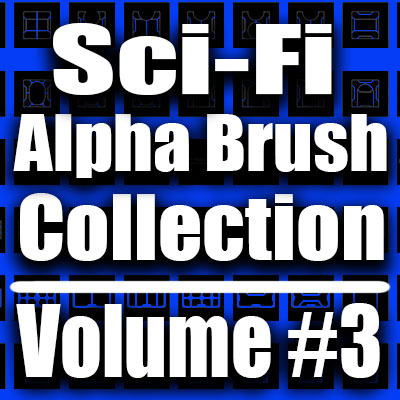 Sci-Fi Alpha Brush Collection- Volume #3 & Sci-Fi Dropship Model and Textures. *Note: This tutorial is Part 2 to "3D Coat 4.7- Sci-Fi Detailing I- Normal Map Sculpting". Table of Contents for Volume #23: Chapter 1- Intro, Chapter 2- Thruster Ring Panels Alpha Brush, Chapter 3- Engine Compartment Detail (Part One), Chapter 4- Engine Compartment Detail (Part Two), Chapter 5- Engine Compartment Detail (Part Three), Chapter 6- Top Fin and Engine Compartment Detail , Chapter 7- Thrusters Detail, Chapter 8- Soldier Door Detail, Chapter 9- Thruster Rotator Detail, Chapter 10- Smart Material Set-Up (Input Map Creation), Chapter 11- Cockpit Glass, Chapter 12- Guns (Metal and Rust) Smart Materials, Chapter 13- Extra Paint Detail, Chapter 14- Adding Stenciled Symbols to Engine Compartment, Chapter 15- Export Textures from 3D Coat, Chapter 16- Importing and Setting-Up Textures in Lightwave. Running Time: 3 hrs. 17 mins., High Quality (Screen-Res 1920 x 1080 pixels), Video Format: MP4 (.mp4), Level: Beginner. In Part One of this project based tutorial 3D Instructor Adam Gibson demonstrates how to sculpt Normal Map Detail on a Sci-Fi Dropship. Learn how to use 3D Coat's powerful toolset to create Sci-Fi Style Panels, Bevel and Rivots to bring realism and detail toyour 3D models. Topics: Import Settings, Orthagonal Views, Brush Types, Brush Size, Depth Channel Settings, Panel Design/Flow. *Content Folder Included: Drop Ship 3D Model and 3D Coat Project File. Table of Contents for Volume #22: Chapter 1- Intro, Chapter 2- Import Settings and Orthagonal Views, Chapter 3- Ship Nose Panels (Part One), Chapter 4- Ship Nose Panels (Part Two), Chapter 5- Ship Nose Rivots and Cockpit Glass Frame Rivots, Chapter 6- Soldier Compartment Panels, Chapter 7- Engine Compartment Panels, Chapter 8- Soldier Compartment Door (Outer Detail), Chapter 9- Fin Detail (Top and Rear), Chapter 10- Fin Panels (Top and Rear), Chapter 11- Wing Rotator Panels (Front and Rear), Chapter 12- Wing Panels and Bevels, Chapter 13- Front Wing Panels, Chapter 14- Soldier Compartment Door Edging, Chapter 15- Front Wing Bevels, Chapter 16- Final. Running Time: 3 hrs. 36 mins., High Quality (Screen-Res 1920 x 1080 pixels) , Video Format: MP4 (.mp4), Level: Beginner. 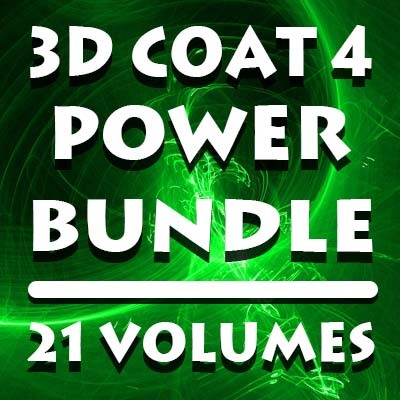 This 3D Coat Version 4 Bundle contains Volumes #1 to #21 (21 Volumes)!! Topics Include: User Interface, Voxels, 3D Painting, UV Mapping, PBR Materials, Retopology, Auto-Retopology, Texture Baking, Photo-Painting, Masking Tools and more!! Bonus Content: Dino Mega-Pack (40 Dinosaur Models), Creature Eye-Pack Volume #1, and Sci-Fi Alpha Brush Collection Volume #1 (100 Alpha Brushes). In this twenty-first video volume of 24 volumes 3D Instructor Adam Gibson goes through a project based session of Hard Surface UV Mapping of a multi-mesh layered sci-fi vehicle. UV Mapping for a lot of 3D artists can be a frustrating task. In this course easy to use work-flow tips and concepts are discussed and demonstrated to get you UV Mapping your 3D models quickly and efficiently. *Bonus: Content Folder Included. Table of Contents for Volume #21: Chapter 1- Intro, Chapter 2- What is Hard Surface UV Mapping? Chapter 3- 3D Model Preparation Tips and Gotchas, Chapter 4- Breaking Up Model Layer into Easier to Unwrap Pieces, Chapter 5- Importing Model Into 3D Coat & Surface Materials/Paint Objects Visibility, Chapter 6- Interior Compartment UV Unwrap, Chapter 7- Exterior Compartment UV Unwrap, Chapter 8- Rear Hatch Plate UV Unwrap, Chapter 9- Front Wing Rotators UV Unwrap, Chapter 10- Front Wing Thrusters UV Unwrap, Chapter 11- Front Wings UV Unwrap, Chapter 12- Upper Laser Cannons UV Unwrap, Chapter 13- Lower Laser Cannons UV Unwrap, Chapter 14- Cockpit UV Unwrap, Chapter 15- Tail Fin UV Unwrap, Chapter 16- Rear Wing Thrusters UV Unwrap, Chapter 17- Rear Wings UV Unwrap, Chapter 18- Rear Wing Rotators UV Unwrap, Chapter 19- Rear Compartment UV Unwrap, Chapter 20- Tail Fin Support UV Unwrap, Chapter 21- Cockpit Nose UV Unwrap, Chapter 22- Top Cap Panel UV Unwrap, Chapter 23- Compartment Doors UV Unwrap, Chapter 24- Rear Fins UV Unwrap, Chapter 25- Export to UV Unwrapped Model to Lightwave, Chapter 26- Final. Running Time: 4 hrs. 4 mins. High Quality (Screen-Res 1920 x 1080 pixels), Video Format: MP4 (.mp4), Level: Beginner. In this twentieth video volume of 24 volumes 3D Instructor Adam Gibson introduces the 3D student to the exciting new Smart Materials in 3D Coat 4.5. Learn to texture your models faster than ever before!! Super powerful for detailing and dirtying up vehicles, machines, robots, spaceships, architecture and list goes on and on!! Learn how to modify and create your own massive library of Smart Materials for your own projects!! Table of Contents for Volume #20: Chapter 1- Intro, Chapter 2- How to Create a Smart Material from Scratch, Chapter 3- Roughness and Metalness Parameters, Chapter 4- Export: Roughness/Metalness (Also Ambient Occlusion, Curvature, and Color Maps), Chapter 5- Export: Specular/Metalness (Also Ambient Occlusion, Curvature, and Color Maps), Chapter 6- Export: Gloss/Color Specular (Non-PBR Output), Chapter 7- Lightwave Import and Image Map Set-Up, Chapter 8- AO (Ambient Occlusion) Layer Export, Chapter 9- Final. Running Time: 1 hr. 49 mins., High Quality (Screen-Res 1920 x 1080 pixels) , Video Format: MP4 (.mp4), Level: Beginner. In this nineteenth video volume of 24 volumes 3D Instructor Adam Gibson introduces the 3D student to the exciting new Smart Materials in 3D Coat 4.5. Learn to texture your models faster than ever before!! Super powerful for detailing and dirtying up vehicles, machines, robots, spaceships, architecture and list goes on and on!! Learn how to modify and create your own massive library of Smart Materials for your own projects!! In this volume some of the topics covered are: Transparency Smart Matierials (Dust, Dirt, Rust, Scratches), Paint Layer Settings (Layer Opacity, Blend Modes), Fill Brush Modes for Smart Materials (Layer, Surface Material, Object). Table of Contents for Volume #19: Chapter 1- Intro, Chapter 2- Transparency Smart Materials (Part One), Chapter 3- Transparency Smart Materials (Part Two), Chapter 4- Combining Transparency Smart Materials and Paint Layer Settings, Chapter 5- How to Name UVs, Surfaces, and Layers in Lightwave for use with the Fill Tool, Chapter 6- How Lightwave Attribute Naming Converts to 3D Coat, Chapter 7- Fill Tool (Layer Mode), Chapter 8- Fill Tool (Surface Material Mode), Chapter 9- Fill Tool (Object Mode), Chapter 10- How to Hide, Mesh Items by Surface Materials or Paint Object (Layers), Chapter 11- Final. Running Time: 1 hr. 49 mins., High Quality (Screen-Res 1920 x 1080 pixels) , Video Format: MP4 (.mp4), Level: Beginner. In this eighteenth video volume of 24 volumes 3D Instructor Adam Gibson introduces the 3D student to the exciting new Smart Materials in 3D Coat 4.5. Learn to texture your models faster than ever before!! Super powerful for detailing and dirtying up vehicles, machines, robots, spaceships, architecture and list goes on and on!! Learn how to modify and create your own massive library of Smart Materials for your own projects!! Table of Contents for Volume #18: Chapter 1- Intro, Chapter 2- What is PBR (Physically Based Rendering) ?, Chapter 3- Evironment Maps Introduction, Chapter 4- How to Import an Evironment Map, Chapter 5- Evironment Map Controls (Blur, Angle, Intensity), Chapter 6- What are Smart Materials?, Chapter 7- Smart Material Preview Window, Chapter 8- How to Paint and Erase Smart Materials, Chapter 9- Smart Material Editor Introduction, Chapter 10- How to Create a Smart Material Preset, Chapter 11- Final. Running Time: 1 hr. 42 mins., High Quality (Screen-Res 1920 x 1080 pixels) , Video Format: MP4 (.mp4), Level: Beginner. In this seventeenth video volume of 24 volumes 3D Instructor Adam Gibson introduces the 3D student to 3D Coat's powerful texture baking tools. Covers: Baking Voxel Displacement Maps, Baking Scan-Depth (Inner-Outer) Shell, Baking Voxel Shader Attributes (Color, Normal, and Specular Maps), Baked Layers in the Paint Room, Lightwave Import/Setup, and Lightwave Displacement Node. Table of Contents for Volume #17: Chapter 1- Intro, Chapter 2- Baking Voxel Shaders (Part One), Chapter 3- Baking Voxel Shaders (Part Two), Chapter 4- Exporting the Mesh and Image Maps from 3D Coat, Chapter 5- Importing Baked Voxel Maps into Lightwave, Chapter 6- Adjust Ambient Intensity, Chapter 7- Baking the Voxel Displacement Map (Part One), Chapter 8- Baking the Voxel Displacement Map (Part Two), Chapter 9- Importing the Voxel Displacement Map into Lightwave, Chapter 10- Adjusting the Displacement Node in Lightwave, Chapter 11- Final. Running Time: 1 hr. 40 mins., High Quality (Screen-Res 1920 x 1080 pixels), Video Format: MP4 (.mp4), Level: Beginner. In this sixteenth video volume of 24 volumes 3D Instructor Adam Gibson introduces the 3D student to 3D Coat's powerful texture baking tools. Learn how to Bake Voxel Color, Voxel Displacement and Voxel Ambient Occlusion Data to your models. Table of Contents for Volume #16: Chapter 1- Intro, Chapter 2- Voxel Detail to Normal Map and Ambient Occlusion Map, Chapter 3- Export AO Map, Chapter 4- Import Model and Normal Map into Lightwave, Chapter 5- Color Baking (Part One), Chapter 6- Color Baking (Part Two), Chapter 7- Final. Running Time: 1 hrs. 26 mins., High Quality (Screen-Res 1920 x 1080 pixels) , Video Format: MP4 (.mp4), Level: Beginner. In this fifteenth video volume of 24 volumes 3D Instructor Adam Gibson introduces the 3D student to 3D Coat's powerful photo painting and masking tools. Table of Contents for Volume #15: Chapter 1- Intro, Chapter 2- Model and Image Set-Up, Chapter 3- Image Preview Options (Part One), Chapter 4- Image Preview Options (Part Two), Chapter 5- Image Preview Options (Part Three), Chapter 6- Distort Image Mode, Chapter 7- Edit Material Panel, Chapter 8- Masking Part One, Chapter 9- Masking Part Two, Image Gizmo, and Final. Running Time: 2 hrs. 5 mins., High Quality (Screen-Res 1920 x 1080 pixels) , Video Format: MP4 (.mp4), Level: Beginner. In this fourteenth video volume of 24 volumes 3D Instructor Adam Gibson introduces the 3D student to 3D Coat's powerful Auto-Retopology Tools. So why is Auto-Retopology a needed process? The best 3D texture artists in the world know that in order to have flawless textures you need near perfect UV maps. The problem is that with Organic Sub-D models a process called "Retopology" is usually needed to do that. But the other problem that lies within that is that "Manual Retopology" is just as time consuming as UV Mapping, if not more in some cases. So this is where "Auto-Retopology" comes in to help speed up the process. Table of Contents for Volume #14: Chapter 1- Intro, Chapter 2- What is Auto-Retopology?, Chapter 3- How to Access the Auto-Retopology Wizard for Polygonal and Voxel Objects (Part One), Chapter 4- How to Access the Auto-Retopology Wizard for Polygonal and Voxel Objects (Part Two), Chapter 5- Poly Density Masking, Chapter 6- Guide Strokes for Redirecting Poly Flow, Chapter 7- How to Export your Mesh to Other Software and Clean-Up, Chapter 8- Hard Surface Hard Edge Auto-Retopology, Chapter 9- Applying Auto-Retopology to a Parasaurolophus Dinosaur, Chapter 10- Final. Running Time: 2hrs. 10 mins., High Quality (Screen-Res 1920 x 1080 pixels), Video Format: MP4 (.mp4), Level: Beginner. In this thirteenth video volume of 24 volumes 3D Instructor Adam Gibson goes through a fun project based tutorial on how to add detail through Normal and Displacement maps onto a Giganatosuarus dinosaur in 3D Coat Version 4. A great tutorial for beginners and those who want to create their own Jurassic Park. Table of Contents for Volume #13: Chapter 1- Intro, Chapter 2- Lightwave Model Review in Lightwave, Chapter 3- How to Import Mesh Layers and UVs into 3D Coat, Chapter 4- How Set-Up Alpha Brushes for Creating Scales and Creatng your Own Alpha Brushes, Chapter 5- Creating Body Scales, Chapter 6- Creating Tail Scales, Chapter 7- How to Fix and Touch Up Bad Scales, Chapter 8- Creating Arm and Finger Scales, Chapter 9- Head Detailing (Part One), Chapter 10- Head Detailing (Part Two), Chapter 11- Gum Detailing, Chapter 12- Gum Detail Review, Chapter 13- Horn Detail, Chapter 14- Exporting Model and Maps from 3D Coat, Chapter 15- Checking the Normal Maps in Lightwave in VPR Mode, Chapter 16- Connecting Displacement Map Node and Final. Running Time: 3 hrs. 15 mins., High Quality (Screen-Res 1920 x 1080 pixels), Video Format: MP4 (.mp4), Level: Beginner. 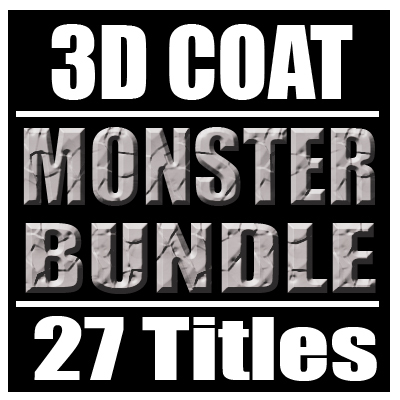 This bundle contains all 15 "3D Coat Version 3 Titles" and "3D Coat Version 4 Titles (Volumes #1 to #12). Various Topics include: UV Mapping, Voxel Sculpting, 3D Painting, Painting with Photos, Retopology, Auto-Retopology, Color Maps, Normal Maps, Displacement Maps, Lightwave Integration and more!!! 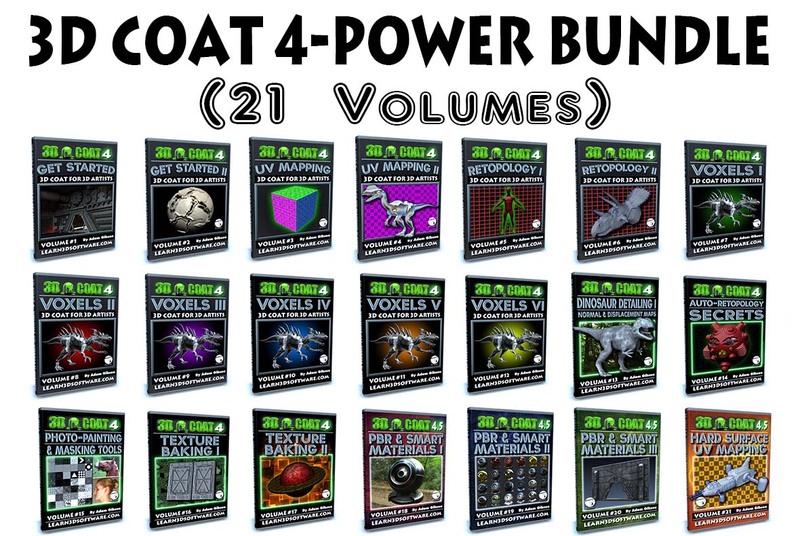 In this eleventh video volume of 12 volumes 3D Instructor Adam Gibson introduces the 3D student to Voxels in 3D Coat Version 4. A great tutorial for beginners. Table of Contents for Volume #11: Chapter 1- Intro, Chapter 2- Merge Tool: Importing Sub-D Objects from Other 3D Packages, Chapter 3- Merge Tool: Importing Polygonal Objects and Hard Surface Models, Chapter 4- Merge Tool: Add Boolean, Chapter 5- Merge Tool: Subtract Boolean, Chapter 6- Merge Tool: Booleans (Add and Subtract) Using Symmetry, Chapter 7- Merge Tool: Boolean Intersect, Chapter 8- Merge Tool: Boolean Split, Chapter 9- Final. Running Time: 1 hrs. 48 mins. High Quality (Screen-Res 1920 x 1080 pixels) , Video Format: MP4 (.mp4), Level: Beginner. 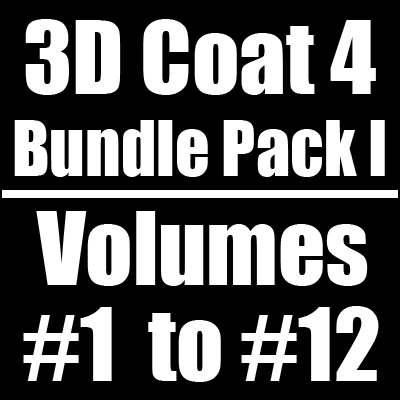 In this tenth video volume of 12 volumes 3D Instructor Adam Gibson introduces the 3D student to Voxels in 3D Coat Version 4. A great tutorial for beginners. Table of Contents for Volume #10: Chapter 1- Intro, Chapter 2- Sketch Tool (Part One), Chapter 3- Sketch Tool (Part Two), Chapter 4- Voxel Representation Mode and Surface Representation Mode, Chapter 5- Vox Tree: How to Add Sub-Objects, Chapter 6- Vox Tree: How to Import Custom Polygon Objects, Chapter 7- Vox Tree: How to Add a New Layer, Chapter 8- Vox Tree: How to Delete a Layer, Chapter 9- Vox Tree: Duplicate Layer, Chapter 10- Vox Tree: Shader Edit Settings, Chapter 11- Vox Tree: Symmetrical Copy, Chapter 12- Vox Tree: Increase Voxel Resolution, Chapter 13- Vox Tree: Clone and Decrease Resolution x 2, Chapter 14- Vox Tree: Clear Voxel Layer, Chapter 15- Final. Running Time: 1 hrs. 47 mins., High Quality (Screen-Res 1920 x 1080 pixels), Video Format: MP4 (.mp4), Level: Beginner. In this fourth volume of 12 volumes 3D Instructor Adam Gibson will not only show you how to get up and started surfacing your 3D models in Lightwave 2018 but will also introduce you to some the new powerful features. 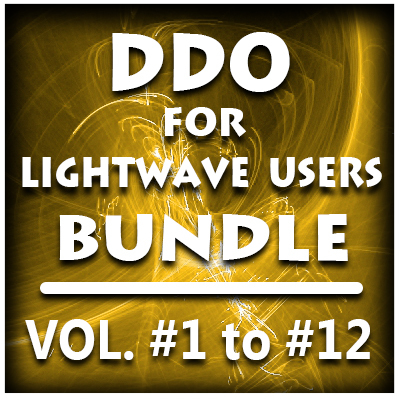 A great place to start for beginner Lightwave Users. FREE Bonus Content: Premade 3D Practice Models (in Lightwave 3D (.lwo) format. In this third volume of 12 volumes 3D Instructor Adam Gibson will not only show you how to get up and started using Lightwave 2018 but will also introduce you to some the new powerful features. A great place to start for beginner Lightwave Users. Some of the Topics Covered: 1) Backdrop Color 2) Gradient Backdrop, 3) SkyTracer 2 Introduction & Basics, 4) Backdrop Images, 5) Spherical Light, 6) Primitive Light *FREE Bonus Content: 1) Free Dinosaur Mega-Pack (Reg. $49.00 US), 2) Free Posed Alien Model. In this first volume of 12 volumes 3D Instructor Adam Gibson will not only show you how to get up and started using Lightwave 2018 but will also introduce you to some the new powerful features. A great place to start for beginner Lightwave Users. Some of the Topics Covered: 1) User Interface Basics, Viewports, Image Editor, Importing Models, Item Animation Tools, PBR (Spec/Gloss & Metallic) Node Basics, VDB Import, Volumetric Primitives, Shape Primitives, Buffer Drop Down List, Surface Noise Removal, Creating an Asteroid, Making Rocky Terrains, and Render Basics. Running Time: 4 hrs. 23 mins., High Quality (Screen-Res 1920 x 1080 pixels) , Video Format: MP4 (.mp4), Level: Beginner. Hey Kids!! Things are about to get very Hairy!! and Furry!! In this four volume training series 3D Instructor Adam Gibson will show you how to add Hair, Fur, Grass, and other cool Fibrous detail to your 3D Characters and 3D Models using Lightwave 3D's powerful Fur & Hair System!! FiberFX is a fairly deep package with a lot of great features/options. Lots of Buttons and Controls to tackle. With that being said it can very scary and confusing to get started without getting lost or frustrated. This four volume course is specifically designed to help beginner 3D students get started quickly through easy to follow tool-based and small project-based video chapters!! FREE Bonus Content: 3D Practice Character Models are included in the digital download. *(Free Tiger, Elephant, Rhino, Human Female and Puff-Ball character models included!!) Learn the tools to make all sorts of traditional, wild and messy hairdos!! Easily create that "Bed-Head" look!! This massive Character Rigging Course is designed specifically for beginner 3D students who have never rigged a character in Lightwave or any other 3D package. Basic rigging concepts and principles are shown to get you up and started fast allowing you to be able to easily pose and control your characters movements with Lightwave's powerful rigging toolset. In this highly detailed course a Human Biped Character will be rigged using Lightwave's traditional rigging toolset first and then using the Genoma 2 Bi-Ped Rig (Lightwave's Auto-Rigging System). Learn how to Use and Download 2 pieces of "Free Character Creation Software" so that you can build thousands of your own detailed characters of all shapes and sizes that you can export and use in your Lightwave projects. Topics: Preparing your Models, Traditional Rigging Tools, Genoma Rigging, Bone Tools, Skelegons, Weight Maps, Facial Morphs (Endomorphs), Export/Import of DAZ Studio Characters, Export/Import of Make Human Characters, Surface Editing, Character Creation in DAZ Studio/Make Human Software, Saving Rig Presets, Inverse Kinematics (IK), Arm/Foot/Head/Eye Controls, Muscle Flexing/Joint Compensation. Also learn how you can import and use beautiful DAZ 3D Characters in Lightwave 3D. *Note: This course is not recommended for advanced-level or experienced rigging artists. *Bonus: Content Folder Included containing Scene, Model files, and Printable Pin-Up Notes/Diagrams from the tutorials. This course is designed specifically for those who are beginners in 3D modeling and also for those who may have had some difficulty in understanding the concepts of 3D modelling. Lightwave has a massive set of great modeling tools but most beginners are overwhelmed and don't know where to start. In this video training course 3D Instructor Adam Gibson takes you through the most important modeling tools to get you up and running fast for your own projects. Polygonal and Sub-D Modeling tools/concepts will be a covered along a with a full project-based creature modeling journey from concept art to a finished modeled beast. Tips and tricks on how to quickly Sculpt and Shape Sub-D Body Parts (Torso, Arms, Legs, Claws, Tails, Heads, Teeth), Importing Reference Concept Art, Mastering the Use of Basic Tools (Move, Rotate, Drag, Stretch, Knife Tool, Band-Saw Pro, Extender Plus). *Bonus: Content Folder Included that contains the Creature Model files and Reference Concept Art from the video tutorial. Running Time: 14 hrs. 5 mins., High Quality (Screen-Res 1920 x 1080 pixels), Video Format: MP4 (.mp4), Level: Beginner. In this sixth volume 3D Instructor Adam Gibson introduces the 3D student to how Normal Maps work within Substance Painter 2. Some of the topics covered: Height Map to Normal Map Conversion, Normal Map Alpha Brushes, PB Texture Baker Plugin for Lightwave, Creating Input Normal Maps, Height Map Strength (Positive/Negative), Normal Sculpting Tips, Combining Height and Normal Channels. Table of Contents for Volume #6: Chapter 1- Intro, Chapter 2- Normal Map Concepts, Chapter 3- High-Poly to Low-Poly Normal Map Baking Concepts (Part One), Chapter 4- High-Poly to Low-Poly Normal Map Baking Concepts (Part Two), Chapter 5- Baking Input Normal Using High-Poly to Low-Poly in Substance Painter, Chapter 6- Baking Input Normal Using High-Poly to Low-Poly Using PB Texture Baker, Chapter 7- How to Use the New Orthagonal Views in Substance Painter 2, Chapter 8- Converting Height Channels to Normal Map Inputs, Chapter 9- Converting Normal Channels to Normal Map Inputs, Chapter 10- Tips and Tricks (More Normal Map Creation Secrets), Chapter 11- Final. Running Time: 3 hrs. 21 mins., High Quality (Screen-Res 1920 x 1080 pixels), Video Format: MP4 (.mp4), Level: Beginner. In this 10th Volume of our 2015 training series 3D Instructor Adam Gibson introduces the beginner 3D student how to get started using Lightwave's powerful surfacing tools. Table of Contents for Volume #10: Chapter 1- Intro, Chapter 2- What is Surfacing?, Chapter 3- Polygons and Surface Normals, Chapter 4- Color Channel Basics, Chapter 5- Creating Surface Names and Renaming Surfaces, Chapter 6- Working with Multiple Surfaces, Chapter 7- Smoothing Angle, Chapter 8- Luminosity Channel, Chapter 9- Enable Glow, Chapter 10- Diffuse Channel, Chapter 11- Specular and Gloss Channels, Chapter 12- Reflection Channel, Chapter 13- Transparency and Refraction Index, Chapter 14- Object Dissolve, Chapter 15- Translucency Channel, Chapter 16- Bump Channel, Chapter 17- Double Sided Polygons, Chapter 18- Surface Presets (Colors, Metals, Rock, Fabric, Glass and More), Chapter 19- Gradients Introduction, Chapter 20- Nodes Introduction (Part One), Chapter 21- Nodes Introduction (Part Two), Chapter 22- Final. Running Time: 4 hrs. 0 mins., High Quality (Screen-Res 1920 x 1080 pixels), Video Format: MP4 (.mp4), Level: Beginner. In this latest Lightwave 2015 Series tutorial 3D Instructor Adam Gibson will demonstrate how to quickly UV Map a Parasaurolophus Dinosaur model using the "ABF UV Unwrap" tool and the "PLG UV Tools" Plugin (Free Plugin). Learn how to systematically break up your model for easy flattening of UV Islands. Tips and Tricks are also shown on how to avoid typical problems and also how to deal with issues along the way. Table of Contents for Volume #9: Chapter 1- Intro, Chapter 2- UV Workflow for Project, Chapter 3- Dividing Up Body Parts (Part One), Chapter 4- Dividing Up Body Parts (Part Two), Chapter 5- Body UV Map, Chapter 6- Front Feet UV Map, Chapter 7- Claws of Front Feet UV Map, Chapter 8- Inner Mouth UV Maps, Chapter 9- Inner Nostrils, Eye Sockets, Ear Sockets UV Map, Chapter 10- Claws UV Map, Chapter 11- Neck UV Map, Chapter 12- Tail UV Map, Chapter 13- Eyes UV Map, Chapter 14- Arms UV Map, Chapter 15- Rear Feet UV Map, Chapter 16- Legs UV Map, Chapter 17- Head UV Map, Chapter 18- Merging Body Parts into One Layer and Merging Points, Chapter 19- Using the PLG Pack UV Chart Plugin, Chapter 20- Final. Running Time: 2 hrs. 44 mins., High Quality (Screen-Res 1920 x 1080 pixels) , Video Format: MP4 (.mp4), Level: Beginner. In this training tutorial 3D Instructor Adam Gibson introduces the new and powerful DDO Painter to the currently released Quixel Suite 2.0. Learn how to get started quickly texturing your 3d models using the new painting tools and how to create automated input maps without having to leave the Quixel Suite. Table of Contents for Volume #7: Chapter 1- Intro, Chapter 2- Input Map Baking Glitch in 3DO (Work-Around Explained), Chapter 3- Baking Input Maps Via NDO (AO, Curvature, Object Space Normal, XYZ Gradient), Chapter 4- Baking Input Maps Via DDO (AO, Curvature, Object Space Normal, XYZ Gradient), Chapter 5- DDO Paint Brush Basics (Brush Size, Changing Colors, Albedo Viewing Mode), Chapter 6- DDO Paint Brush Basics (Channel Selection, Transferring Paint Data to Image Maps), Chapter 7- How to Add a Bump Channel in DDO and Paint Bump Displacement, Chapter 8- Keyboard Shortcuts (Othographic/Perspective Toggle, 90-Degree Ortho-Views), Chapter 9- Gloss Channel Painting, Chapter 10- How to Paint on Meshes with Multiple Groups, Chapter 11- Dynamask Painting, Layer Blending, Adding Dirt, Bump Map Detail, Chapter 12- Exporting Final Maps from DDO to Lightwave and Initial Texture Set-Up, Chapter 13- Test Renders in Lightwave, Chapter 14- Post Process Render Presets in 3DO and Final. Running Time: 2 hrs. 28 mins., High Quality (Screen-Res 1920 x 1080 pixels), Video Format: MP4 (.mp4), Level: Beginner. UV Mapping has always been one of the most challenging and dreaded aspects for creating amazing textures for 3D models. 3D artists around the world know this pain as it can be a very lengthy process trying to get your UV Maps with as little "Texture Distortion" as possible with manual tweaking methods which is necessary in most typical 3D packages. In this video course 3D Instructor Adam Gibson will be showing how to get started fast using the amazing "UV Layout" Software Package with Lightwave 3D!! Although Lightwave 3D will be used in this course with UV Layout, the concepts and techniques can easily be used with any other 3D Software package like: Modo, Maya, 3D Max, 3D Coat, ZBrush, etc. When it comes to UV Mapping, UV Optimization is the Key to getting near perfect UV Maps. Manual Optimization Methods (in other words tweaking your maps by hand) with the typical checkboard pattern can be extremely long and tedious, frustrating, and not to mention cutting into your production time where you could be working on other more important things. Spending more time on modeling and the actual textures for you model can be immensely stolen by having to spend hours, days, weeks tweaking your UV Maps. With that being said "UV Layout" not only contains all the traditional UV Map editing tools, but has one of the industries top "Automated UV Map Optimizers" at a very low price. With a few mouse clicks and few seconds of your time, your UV Maps can be flattened and optimized with amazing accuracy which would in most cases be impossible with manual methods. In this course we demonstrate how to 1) Create all your UV Maps within UV Layout and 2) How to Import and Optimize UV Maps that have been Created in Other 3D Software Packages. Running Time: Volume #1- 2 hrs. 30 mins. and Volume #2- 3 hrs. 39 mins., High Quality (Screen-Res 1920 x 1080 pixels), Video Format: MP4 (.mp4), Level: Beginner. In Particles and HyperVoxels II 3D Instuctor Adam Gibson demonstrates how to make your particles and hypervoxels interact with other objects and 3D Models in your scene. This can be useful for limitless amount of situations whether it be making dust, debris or liquids fall and bounce off the ground, a character, or any other 3d models in the scene or for making a 3d object realistically pass through smoke, steam, or fire. The possibilities are limitless. In the second part of the tutorial how to convert your 3D models/meshes into Particle Emitters is shown. This is a very powerful feature as you can create effects like making your 3D models look like they are on fire or emitting smoke or steam or even sweating. If you are new to Lightwave 3D this a great tutorial to get started fast with Particles and HyperVoxels. Table of Contents for Volume #8: Chapter 1- Intro, Chapter 2- Collision Object (Plane-Type), Chapter 3- Collision Object (Roughness Setting), Chapter 4- Using 2 Collision Planes at the Same Time, Chapter 5- Collision Mode Types, Chapter 6- Polygonal Collision Mode (for Polygonal Models), Chapter 7- HyperVoxel Surface Permeation Problem (Radius/Level Fix), Chapter 8- SubDiv Collision Mode (for Sub-D Models), Chapter 9- Particle Collision Using Textured Deformed Terrains, Chapter 10- Using an Object/Mesh as a Particle Emitter, Chapter 11- Final. Running Time: 1 hrs. 51 mins., High Quality (Screen-Res 1920 x 1080 pixels), Video Format: MP4 (.mp4), Level: Beginner. Learn How to Create Clouds and Outer Space Nebulas in Lightwave 2015. Spice up your sky environments and outer space scenes. In this Beginner Level Lightwave 2015 tutorial Adam Gibson demonstrates easy to follow steps for Cloud and Nebula creation in Layout. So if you are new to Particles and HyperVoxels this tutorial is a great place to start. Table of Contents for Volume #7: Chapter 1- Intro, Chapter 2- HyperVoxel Cloud Concepts, Chapter 3- HyperVoxel Cloud Initial Set-Up, Chapter 4- HyperVoxel Cloud (Stretch Direction Input Parameter), Chapter 5- HyperVoxel Cloud (Shading Using Procedural Textures), Chapter 6- Nebula Creation (Using a Multi-Colored Gradient), Chapter 7- Nebula Render and Tweaking, Chapter 8- Final. Running Time: 1 hrs. 34 mins., High Quality (Screen-Res 1920 x 1080 pixels) , Video Format: MP4 (.mp4), Level: Beginner. This model pack contains over 40 Untextured 3D Dinosaur models in 6 different model formats. Formats: LWO, OBJ, 3DS, XSI, MAYA, and MAX. The purpose of this Model pack is so that you may practice your rigging, UV Mapping, Retopology, and Texturing Skills on Pre-made 3D Models. Have fun with our Dinosaurs and make your own adventures with them and also give them your own style and look. -You may use our royalty free 3d dinosaurs for your animations in film/video or still images. Below is a list of the dinosaurs included in this model pack: Achelousaurus, Anhanguera, Apatosuarus, Brachiosaurus, Camptosaurus, Centrosaurus, Chasmosaurus, Corythosaurus, Deinonychus, Dilophosaurus, Dsungaripterus, Einiosaurus, Germanodactylus, Gnathosaurus, Ichthyosaurus, Iguanodon, Kentrosaurus, Kritosaurus, Lambeosaurus, Maiasaura, Monoclonius, Ouranosaurus, Pachyrhinosaurus, Parasaurolophus, Pteranodon, Pteranodon Sternbergi, Saurolophus, Shonisaurus, Spinosaurus, Spinosaurus (Textured), Stegosaurus, Styracosaurus, Suchomimus, Tenontosaurus, Therizinosaurus, Triceratops, Troodon, Tropeognathus, Tuojiangosaurus, Tyrannasaurus, Velociraptor, Wuerhosaurus, Ankylosaurus, Giganatosaurus. What is Lightwave 3D? Lightwave is powerful 3D Modeling/Animation and VFX software used in the Film and Television Industry by 3D artists/studios in Hollywood and all over the world. This 12 volume series is designed for beginners who are new to 3D or students who are new to Lightwave. The series will be covering everything you need to get started fast. Some of the Topics Covered throughout the 12 Volume Series will be: User Interface, Polygonal Modeling, Sub-D Modeling, UV Mapping, Surfacing Techniques, Animation Basics, Compositing Tools, Particle FX, Genoma II Character Rigging and more!! Table of Contents for Volume #6: Chapter 1- Intro, Chapter 2- Volumetric Light Introduction, Chapter 3- Volumetric Light Types, Chapter 4- How to Create a Vortex Effect with Volumetrics, Chapter 5- Particles Introduction, Chapter 6- Particle Attributes (Part One)- Emitter Size, Birth Rate, Lifetime, Particle Limit, Gravity, Chapter 7- Particle Attributes (Part Two)- Explosion, Vibration, Particle Resistance, Variance, Chapter 8- Snow Particle Scene Set-Up (Part One), Chapter 9- Snow Particle Scene Set-Up (Part Two) and Final. Running Time: 2 hrs. 24 mins., High Quality (Screen-Res 1920 x 1080 pixels) , Video Format: MP4 (.mp4), Level: Beginner. What is Lightwave 3D? Lightwave is powerful 3D Modeling/Animation and VFX software used in the Film and Television Industry by 3D artists/studios in Hollywood and all over the world. This 12 volume series is designed for beginners who are new to 3D or students who are new to Lightwave. The series will be covering everything you need to get started fast. Some of the Topics Covered throughout the 12 Volume Series will be: User Interface, Polygonal Modeling, Sub-D Modeling, UV Mapping, Surfacing Techniques, Animation Basics, Compositing Tools, Particle FX, Genoma II Character Rigging and more!! Table of Contents for Volume #5: Chapter 1- Intro, Chapter 2- Fog FX Scene Set-Up (Fog Color, Thickness, Backdrop, Gradient Backdrop), Chapter 3- Fog Min Distance and Max Distance Circles (Radius), Chapter 4- Setting Up Textured Fog, Chapter 5- How to Animate Fog and Multiple Fog Layers, Chapter 6- Water Plane Set-Up (Basics of Making a Lake or Ocean), Chapter 7- Animating Water (Part One), Chapter 8- Animating Water (Part Two), Chapter 9- Final. Running Time: 1 hrs. 43 mins., High Quality (Screen-Res 1920 x 1080 pixels), Video Format: MP4 (.mp4), Level: Beginner. Copyright © 2016 Adam Gibson. All Rights Reserved.